The U.S. State Department has endorsed the outcome of the November 26 elections in Honduras, which was surely the most farcical electoral process in recent history. The elections were organized by U.S.-backed dictator Juan Hernández in hopes of polishing his image. He ran against Salvador Nasralla, the candidate of the Alliance to Oppose the Dictatorship. As initial returns started to come in, the Supreme Election Tribunal (TSE) reported that Nasralla was ahead by five percentage points with more than half the vote counted. Then it suddenly stopped reporting, saying its computer had a malfunction. Thirty-six hours later, it said the computer was back and the total vote showed Hernández won by 1.6%. The TSE was appointed by the dictator. An electoral observer mission from the Organization of American States (OAS), a group of all nations in the Americas except Cuba that usually backs Washington, said the vote count showed many irregularities, including the statistically improbable late swing in the vote. Declaring that the vote could not be verified as legitimate, the OAS called for new elections. 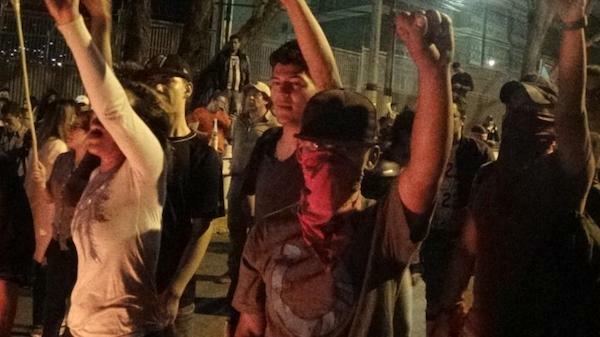 Immediately, there were large protest across Honduras, in every city and in the countryside. In response to the huge mass marches and road blockades, the government declared a state of emergency and a curfew. Protests continued, and were attacked by soldiers with truncheons, tear gas and live ammunition. Police units refused to join the attack, saying they didn’t want to oppress the people. Therefore, the attacks are being carried out by the military police, notorious for being the most repressive part of the armed forces. Their leaders were trained in the U.S. at Fort Benning, Georgia. This turmoil continued for weeks while the TSE said it was reviewing the election. At a point when the protests seemed to be dying down, the TSE announced on December 17 that Hernández was indeed the winner. This provoked renewed demonstrations and more violence by the regime. As of December 19, human rights groups say that at least 22 protesters had been shot and killed, and 1200 arrested since the election. The repression and protests continue. The immediate background to recent dramatic events was the 2009 military coup in Honduras that ousted democratically elected President Manuel Zelaya. The coup was organised by the Obama administration, with then-Secretary of State Hillary Clinton as point person. But there is a longer history of violence and repression carried out by the Honduran ruling class and their backers in the U.S. that long predates Zelaya. “For much of the 20th century,” writes Arturo Rivera in the U.S. Socialist Worker, “Honduras was governed through a pact between the oligarchs and the United Fruit Company – an American corporation with deep ties to the U.S. state. It was from Honduras that the CIA launched the operation to overthrow the democratically elected government of Jacobo Árbenz in Guatemala in 1954 …. “Despite the fact that Honduras officially does not allow formal foreign military bases on its soil, the U.S. effectively maintains such facilities, such as Palmerola and Caratasca. Behind the 2009 military coup were the Honduran oligarchy and Washington. The Obama administration opposed Zelaya because he was aligning Honduras with the left-wing governments of Venezuela, Bolivia and Ecuador that came to power in the 2000s. For the Honduran ruling class, the coup was a reaction to a popular movement led by Zeyala, who promised to call for a constituent assembly to rewrite the constitution to give more rights to workers and peasants. Clinton made a trip to Honduras just weeks before the coup, which was likely organised with the help of the U.S. military bases in the country. It was too well organised to have been carried out by the Honduran military alone. A cable from the U.S. Embassy to Clinton exposed by WikiLeaks showed that Clinton knew of the coup immediately. She initially backed the military’s claim that Zeyala “fled in the middle of the night to avoid justice for his crimes”. It soon came out that the military had kidnapped him and took him to the U.S. base called “SOUTHCOM Joint Task Force Bravo” for instructions from their imperial master on what to do with him. He was then sent him into exile. The coup was condemned by the OAS and the United Nations, both of which called for the immediate restoration of Zeyala as president. The demand was ignored by the Obama administration. “After Zeyala’s removal from power, the Honduran ruling class established an authoritarian regime, using U.S.-supplied and trained military police to crack down on the popular movement from below that was Zeyala’s social base,” wrote Rivera. “The repression has been especially violent against the campesino movement, which led the resistance by recovering land from the landowners in a country with a predominantly agricultural economy. “The most famous victim of this wave of repression was Berta Cáceras, leader of the Indigenous resistance coalition COPINH. Berta was a political prisoner after the coup [later released] and was assassinated in a plot involving the government and paramilitary forces, which work hand-in-hand. Clinton remained Secretary of State until 2013. During this time, she continued her role for Obama as point person regarding Honduras. In 2011, she allowed Zeyala to return to Honduras. She orchestrated the holding of “free and fair elections [held in 2013] … which would render the question of Zeyala moot,” she wrote in her book Hard Choices. In other words, “Free and fair elections” under a military dictatorship established in a violent coup, so as to give a fig leaf cover for the coup. Not much of a fig leaf since, like the recent elections, no one was fooled. In 2013, Marine General John Kelly also visited Honduras as the newly-appointed head of the U.S. Southern Command in charge of U.S. military operations and bases in Central and South America. He made many subsequent visit to the country, and became buddies with Hernández. Now he is in the White House as Trump’s Chief of Staff. Clinton continues to praise Honduras as a shining example of democracy, and blames the country’s problems on drug traffickers. It is true that under the dictatorship, on top of the repression, the military has been involved financially to turn Honduras into a narco-state. Gang terror has gotten so bad it has forced many young people to take the desperate choice to make the arduous and dangerous trip to try to seek asylum in the US. Echoing Clinton is U.S. chargé d’ affairs to Honduras Heidi Fulton, who appeared publicly beside the head of the TSE during the so-called vote recount, giving it de facto endorsement.